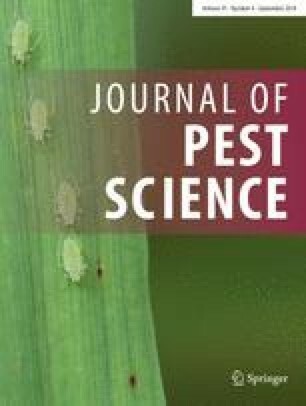 The insecticidal effect of low temperatures for the control of all life stages of two stored-product insects, Plodia interpunctella and Liposcelis bostrychophila, was evaluated under laboratory conditions. The temperatures tested were 0, − 5, − 10 and − 15 °C, and, at these temperatures, the insects were exposed for 2, 4 and 8 h and also for 1, 2, 3 and 7 days. Regarding P. interpunctella, the most cold-tolerant life stage was larvae, given that 2 days of exposure were needed for complete (100%) mortality at − 10 °C. Moreover, all larvae were dead at − 15 °C even after 2 h of exposure. Eggs of P. interpunctella were susceptible to cold, as mortality was complete after 7, 1 day, 2 and 2 h at 0, − 5, − 10 and − 15 °C, respectively. L. bostrychophila was by far less susceptible than P. interpunctella. For this species, adults were still alive even after 7 days at − 10 °C, while complete mortality was achieved only after 1 day at − 15 °C. Eggs of L. bostrychophila were the most cold-tolerant life stage, as survival was observed even after 3 days at − 15 °C. The results of the present study provide the first data set on which all life stages of P. interpunctella and L. bostrychophila are evaluated for their susceptibility to cold treatments in a standardized series of exposures and temperatures. These results are expected to further encourage the “real world” application of cold treatments for the disinfestation of durable stored-products. Christos Athanassiou expresses his appreciation to the Fulbright Foundation for providing the Fulbright Visiting Scholar Grant that made this work possible. This paper reports the results of research only. Mention of trade names or commercial products in this publication is solely for the purpose of providing specific information and does not imply recommendation or endorsement by the University of Thessaly or the U.S. Department of Agriculture. The US Department of Agriculture is an equal opportunity provider and employer. All authors of this work declare that they have no conflicts of interest. The research did not involve human participants and/or animals.